Heat oven to 375°F. Unroll pie crusts. On lightly floured surface, roll or press each crust to 12 inches diameter. Using 4-inch round cutter, cut 6 rounds from each crust. Gently press rounds floured-side-down in bottoms and up sides of 12 ungreased regular-size muffin cups. Bake 9 to 11 minutes or until lightly browned. Meanwhile, in 12-inch nonstick skillet, cook beef and onion over medium-high heat, stirring frequently, about 5 minutes or until beef is thoroughly cooked; drain. Stir in flour until blended. Add broth, salt and pepper. Cook about 2 minutes or until mixture thickens. Stir in frozen mixed vegetables. 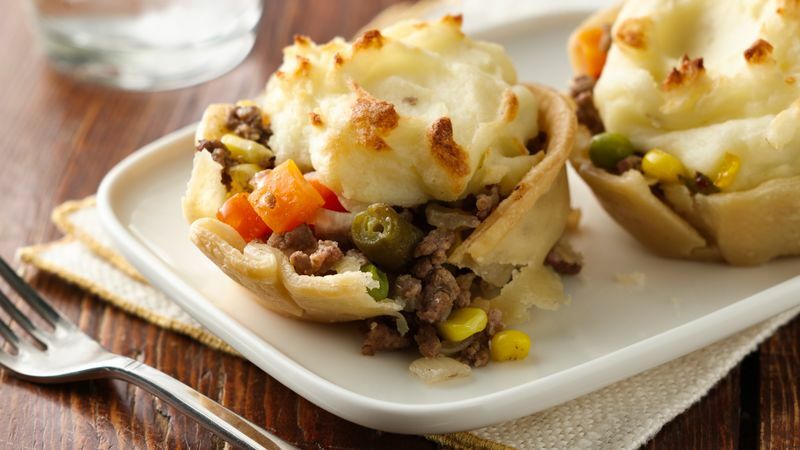 Fill each muffin cup with about 1/4 cup beef mixture. Top each with slightly less than 2 tablespoons potatoes. Bake 20 to 25 minutes or until potatoes are lightly browned. 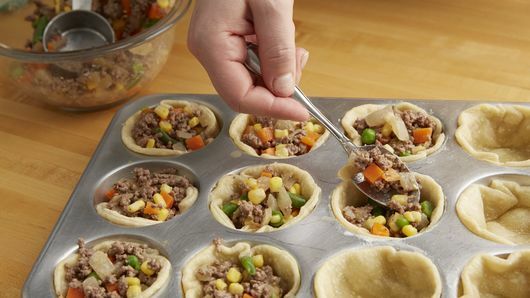 To freeze: After placing pies in muffin cups, wrap muffin pan in foil, and freeze completely. 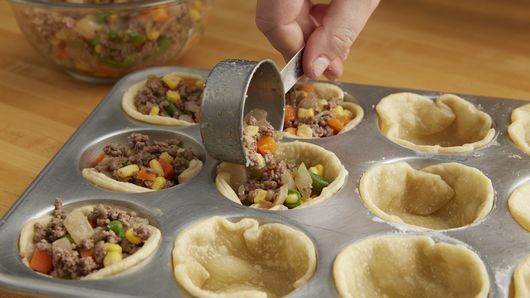 Transfer frozen pies to labeled gallon-size resealable freezer bag. To bake: Heat oven to 375°F. 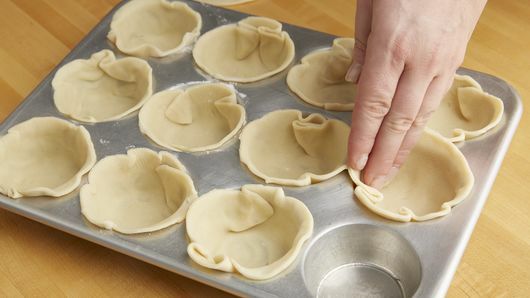 Remove desired number of pies from bag, and place in sprayed muffin cups or ramekins on cookie sheet. 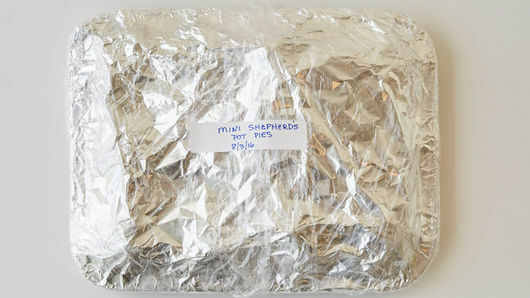 Loosely tent with foil that has been sprayed with cooking spray; bake 20 minutes. Remove foil, and bake 8 to 10 minutes longer or until instant-read thermometer inserted in center reads 165°F. 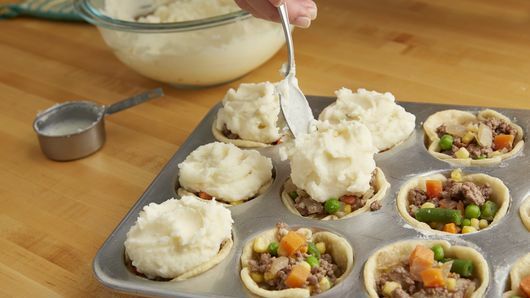 Make your own mashed potatoes using instant mashed potatoes. If you don’t have a 4-inch round cutter, find a small plate you can cut around using a small knife. Sprinkle with chopped parsley after baking.